Electrical code basics and recommended practices for kitchen renovation often seem like pointless rules cooked up in an office boardroom, as electrical code eventually does get hammered out across conference tables. Most of it, however, originates from people who work in the field: electricians, contractors, and other industry professionals. These recommendations influence the U.S. National Fire Protection Association (NFPA). This is the group that writes the National Electrical Code (NEC), which then is adopted in whole or part by your municipality. So it is more than about making your local inspector happy than anything else. Far from draconian, the code addresses only the bare minimum. The NFPA updates the code every three years to meet the increasing requirements of the modern kitchen. Are you current with the code? Requirement: Provide at least two 20-amp, 120-volt circuits to supply power to GFCI (Ground Fault Circuit Interrupter) receptacles for countertop and eating areas. Why: The 20 amps are required (vs. 15 amp) for the higher power requirements found in kitchens. Think toaster ovens, blenders, and mixers. The "two" part of this requirement spreads out the coverage area, though not the total load, as both can be on the same circuit. Providing frequent plug-in points has long been a mainstay of the NEC so that homeowners are not tempted to stretch power cords too far. Requirement: Provide at least one 15-amp, 120-volt circuit feeding a ceiling fixture, recessed lights, and any undercabinet lights. This cannot be on a GFCI circuit. 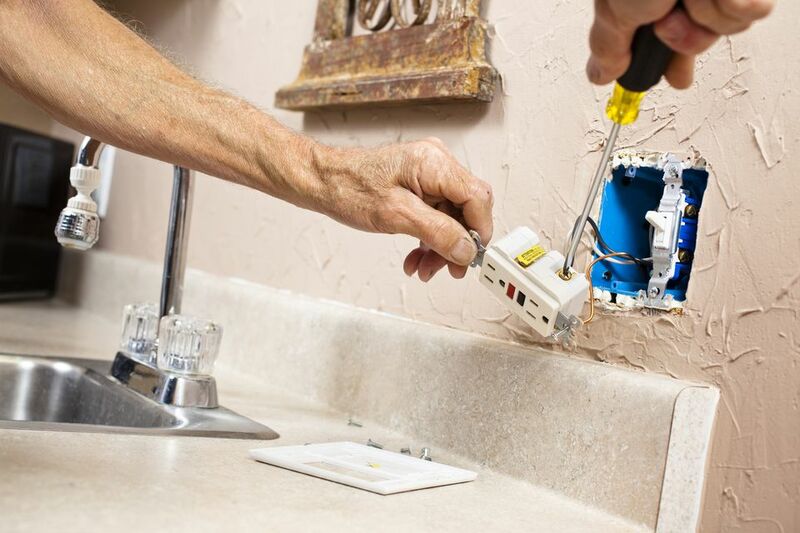 Why: Less amperage is required for light fixtures; however, if you desire more lighting, you will have to bring up the amperage, and other attendant factors, such as wire gauges, etc., to meet those needs. The "one" requirement is the bare minimum to ensure that kitchens have at least some kind of permanent lighting. Finally, if the lights were on GFCI, they might accidentally get tripped off. Requirement: You should allow no more than 48 inches between countertop receptacles. Why: The intent is that a homeowner should not be tempted to stretch a cord more than 24 inches (i.e., half of the required 48 inches) to plug in a small appliance. You can provide GFCIs more frequently than every 48 inches, which is generally seen as the recommended practice. Requirement: All 15 amp and 20 amp outlets, whether GFCI or not, must be tamper-resistant in the following kitchen-related places: small appliance circuit, countertop space, wall, and hallway space. Why: If you have not done electrical work for a few years, you may be surprised by this requirement. If you purchased an older house, there is a likely chance that your house has none of these special outlets. Responding to the danger of children shocking themselves by sticking conductive items (paper clips, bobby pins, etc.) into outlets, the NEC began to require the installation of outlets that have a strong "shutter" inside. This shutter can only be opened when two electrical prongs are pushed into an outlet at the same time--and with great force. These outlets are identified by the letters "TR" on the front yoke of the outlet. Requirement: Countertop sections more than 12 inches wide are considered a "wall" and must have a receptacle (GFCI). Why: People do all sorts of things on tiny sections of countertop, including trying to cram in small appliances. This "12 inches" requirement ensures that whatever power-sucking appliance gets set there will have its own power source. Requirement: Provide one 15-amp, 120-volt dedicated circuit wired with 14/2 cable. Should not be GFCI. Why: "Dedicated" is the important word. This means that the dishwasher gets its own circuit and cannot accidentally trip off (at the circuit level), thus turning off power to other areas of the kitchen. Accidental tripping is also the reason for it, not being GFCI. Finally, 14/2 is the standard cable for a 15-amp circuit. Why: The reason for this is the same as the reason as for the dishwasher circuit, above. Garbage disposal do not have an extended run, like ranges or microwaves. The initial surge is so high that it can easily trip off the circuit breaker, thus turning off other appliances in the kitchen. Requirement: Provide one 20-amp, 120-volt dedicated circuit wired with 12/2 cable. Should not be GFCI. Why: The 20 amp circuit is needed to handle the higher power requirements of microwaves. A 12-gauge cable is standard for any 20-amp circuit. Requirement: Provide one 50-amp, 120/240-volt dedicated circuit wired with appropriately sized wire cable. This should not be GFCI. Why: Electric ranges draw more power in the kitchen than nearly anything else. So, everything about this circuit is super-sized and segregated: a fat cable, big-amp circuit breakers, and a dedicated circuit so as not to trip other appliances or lights.